DWR stands for Durable Water Repellancy -- although it's not durable enough. It's what causes water to bead up and helps the GoreTex do its thing. 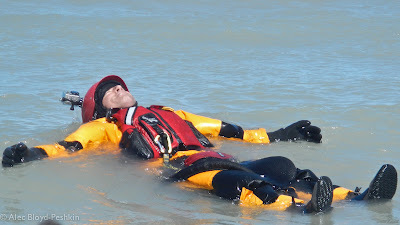 And when the drysuit is 10 years old and you have tryied everything and is still lets water through the fabric. Is it dead then? Any tips to restore breathability? I find my drysuit drier when I immerse myself (roll, practice rescues) frequently than on days where the outer fabric stays (mostly) dry. Leave it soaking in fresh water? Patrik: A ten-year-old drysuit that has been used extensively and been exposed to lots of UV may, in fact, be dead, but check with the manufacturer. Sean: Without knowing what your drysuit is made of, this is hard to answer. Is it possible that you're simply sweating less on days when you immerse yourself more?